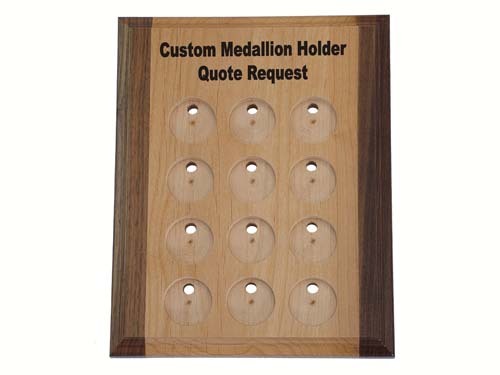 Have a special quote, phrase, or message that you would like to display on one of these beautiful medallion holders? We would love to work with you on your special project! Please tell us as much as possible about your special plaque in the text field above. 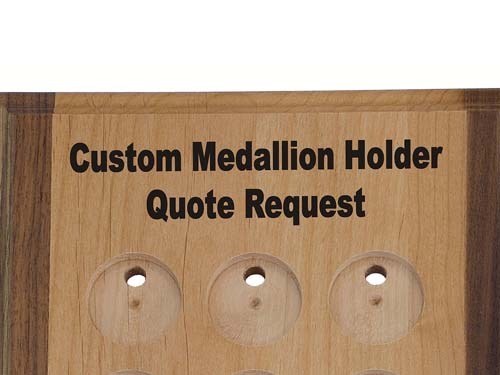 What would you like your custom medallion holder to say? Any special logos, graphics, or fonts? How many custom holders do you think you will require? When will you need to take delivery of your special display plaque? Once you have provided as much information as possible, please proceed through the checkout process in the usual way. You will be asked for your personal contact information but you will not be charged for this quote request. Once we receive your request, we will contact you right away to provide you with a quotation! Thank you for allowing us the opportunity to work with you on this special project! This "quotation item" has "FREE SHIPPING" so you will not be charged for the quotation process in anyway during the checkout process. Please know that if you decide to move forward with the purchase of your custom item, shipping and handling charges will be applied.